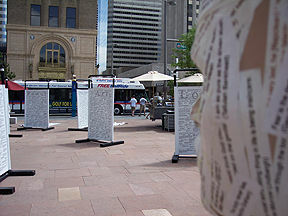 Dialogue Public Art Project: Inspirational Quotations: Denver"
After working to get an official location in Denver for the past 9 months, we were finally given a great spot on the 16th Street Mall following two days of intense last minute jockeying (see the history about securing a location in Denver below). Kevin Scott, the Special Events & Film Liaison with the Denver Office of Cultural Affairs, sprung into action for us and cut through all the red tape in record time! Thank you Kevin! 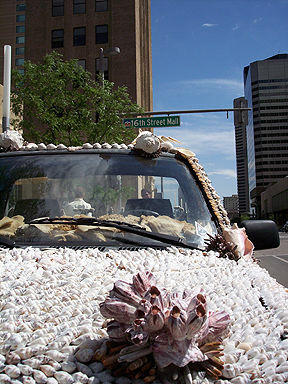 The FOX and NBC news affiliates in Denver came down early this morning (5am) to cover the installation for their morning and afternoon shows. Blake and I woke up at 3am to get there in time (we are staying in Boulder). Since I went to bed at 1am, that gave me 2 hours of sleep. I'm already feeling very exhausted from the entire tour- we have now been traveling for over 6 weeks - so I'm running on low energy at this point. The news crews were fantastic and did good, long stories on the project. The FOX morning show for some reason, though, thought that the project was "controversial" in some way so I kept fielding questions about that. After having Kevin fight for our spot and receiving great media coverage this morning, I thought we'd have a big response from the hundreds of people down on the 16th Street Mall. I was not entirely correct... many people walked by us with little more then a glance. A few people, of course, loved the project and spent quite a bit of time reading. But, for the most part, we had the most people ignore us in this spot then in any other location. I don't think this is a commentary on Denver itself, it's just the location and timing. Everyone seemed to be in a hurry to get somewhere. Sally and Bret arrived late with Shell Truck and the project materials this morning and I also felt we were not getting good morning coverage from our documentary crew. I flew the documentary crew in from New York and they were having travel problems too... car rental issues, etc. So, I guess I finally reached the exhaustion and frustration point by the end of the day today when a thunderstorm came over and doused us while we were just about to pack up. We still have one more city to visit, Salt Lake, but at this point I want to skip it. The most amazing thing about Denver was first, driving in with a light show courtesy of Mother Nature to die for going off. Then, the sunset cloud-limned scene watching the Rockies marched closer and higher with every mile. That was some welcome and intro! The next best thing I liked about Denver was Boulder. That's where we decamped the first night and I got to swim (exercise) for once! The next morning, Boulder's surrounds turned everything surreal. Without a permit, Mike had to get creative. Though really wanting to pass through Denver on his way straight home, instead, he found he showed up for a very important appointment: with himself and his true personal power. Being without a permit inspired Mike to write a really effective email and cc all the right stuff. The proof came 15 minutes after pressing "send", with solid allies coming out of Denver's bureaucratic woodwork ready to meet with us instantaneously. For nine long months beforehand, Mike had emailed them all with nothing to show for it. I have had a few moments of my own effective (and usually angry) letters, so I know how critical it is to suddenly do something that makes all the walls fall and everything works as it should. In today's checkmated and grid-locked world, this happens, if you're lucky, once in a lifetime. Now, Mike knows what it takes to make things happen, and I hope he wields it from now on consciously and apply as needed. This one thing made the entire Denver effort and experience worth it. But, as always, there was so much more. The next thing I liked was my first visit to the Cheesecake Factory--Wow. Stuffed to the gills, we then met a couple of hours after Mike's email with Kevin Scott, from the mayor's office. 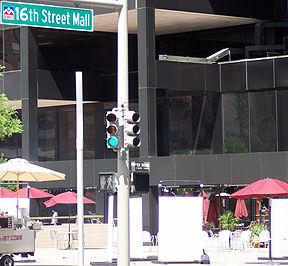 He pointed out possible sites as we walked up 16th Street Mall towards the capital, a very cool walk. Then I liked having to shepherd Bret's safe passage back stepping while filming Mike and Kevin as they talked and strolled. We installed, not in our preferred location, but in a spot that seemed okay. However, it turned out that the traffic at this site, and perhaps the workday time, didn't bring in the number we hoped. But we had great moments, as usual, that always made me feel I really wouldn't want to be anywhere else but right where I was. And always, that realization was a nice surprise. The sausage chef behind the cart at our site was especially friendly. He gave me free samples of his wares- touted to be the best in Denver. That was most appreciated, but still, it was very hard to stomach elk sausage or buffalo, no matter what he said. Later, he came up with an important suggestion, he told us: Each of the quotes need two words added at the end: ... in bed. Very dada. The next thing I really enjoyed was the squall that hit us late afternoon while I was in the middle of selling two books. We all ended up under one umbrella with all our material piled one on top of the other, and I was having a ball. Unfortunately, Mike was not. I had never seen him enraged before. Sizzling, he made it clear this was "IT". Despite all Bret tried to do, we had to pack up. The morning news brought us two dressed-up young men who came to be interviewed for the documentary. I met them, they were so excited about the Project and getting interviewed. I gently told them we were packing up and they walked off, obviously disappointed. When I mentioned them to Mike, he said, "Oh, that would have been a good interview... Where are they?" But they were gone. And we are off to Moab and Salt Lake City... another adventure awaits! NBC & FOX TV news stations came down to do stories on Dialogue. 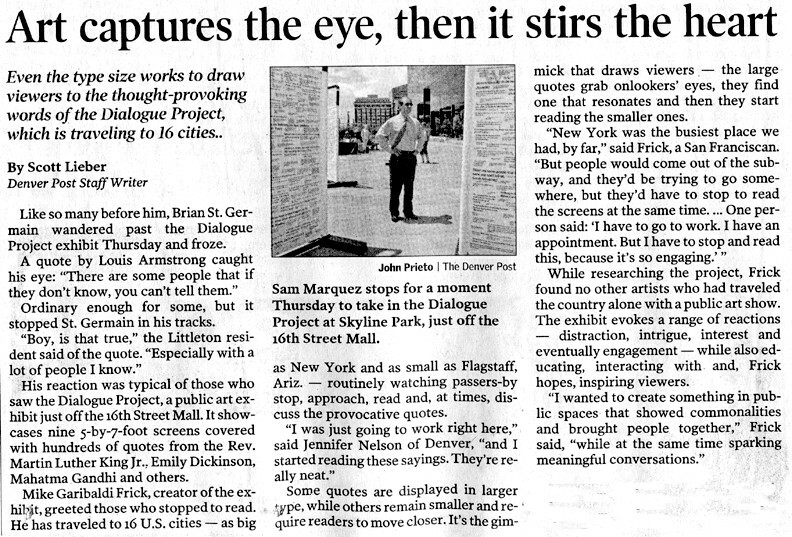 As well as the Denver Post (click on the link below to view the newspaper article). "Thanks so much for the information on your interesting project. 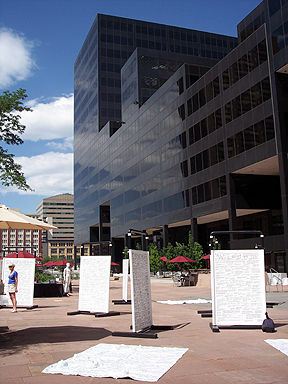 The Denver Office of Cultural Affairs facilitates the Public Art Process for the city and everything we do has to go through prescribed, citizen involved steps. Because of these requirements we cannot become involved in placing art in the city independent of the prescribed procedures. I suggest you contact a Mall, either the Cherry Creek Mall in Denver or the Lab at Belmar in Lakewood." "Thanks for sending your proposal. I have forwarded your information to the Belmar marketing department and they are looking into it. I will let you know if more information is needed." We have decided not to visit Denver and go to Boulder instead this trip. But, we still hope to visit Denver on a future tour someday if someone in the city bureaucracy or cultural leader will help smooth the way a bit. On our arrival in the Denver/ Boulder area, I decided to try one last time to get a location to set-up in Denver. I sent the following letter to a few of the city organizations I had contacted before to see if there would be any response. Not thinking there would be any response, I was extremely surpirsed when I heard back from the Mayor's Office, Cultural Affairs Office and City Council Members within about an hour after sending this email! 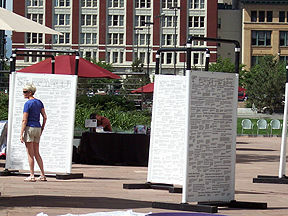 After trying for over a year to secure a location in Denver for the inspirational public art project Dialogue, I ran up against being stonewalled and sent in circles (sample of responses below to just convey some of the frustration about the simple task of trying to find a location and get permission form *anyone*). The time has now arrived... we are here in Denver. We are planning on setting up Dialogue somewhere in the downtown area the day after tomorrow (June 8th). Channel 9 and Channel 7 news are interested in coming down for their morning shows to cover the event. I'm not sure what to tell them since we don't have a location yet. Our documentary crew will also be with us. We have had an incredible journey around the country for the past 2 months. We've visited cities such as Washington DC, New York, Memphis,Chicago and our last location, St. Louis, with no problems and warm welcomings. Part of our documentary is about freedom of expression in public spaces, the sometimes stifling bureaucracy and how this is reflected in each community we are visiting. Will Denver be the sole city that blocks us out? I'm writing to see if there is one last chance of obtaining official permission before we set-up and/or any last ideas. I know the citizens of Denver will embrace the project. I've included my original request at the bottom of this email for reference.